The FX debuted back in 2003 with its extreme shape, and for 2012, it receives a new face with a bold new grille and fascia design. This is an influence from the stunning Infiniti Essence Concept. This year also marks the debut of a special new model, the Limited Edition, which is based on the all-wheel-drive version of the FX35. My test car was that model. Offered in a special Iridium Blue exterior color, the FX35 Limited Edition boasts 21-inch 10-spoke aluminum-alloy graphite finish wheels with P265/45R21 V-rated all-season tires, dark-tinted headlights with Adaptive Front lighting System (AFS) and auto-leveling, and dark-tinted side air vents and lower door trim. Other features for this special vehicle include aluminum roof rails and roof rail crossbars with graphite finish, aluminum pedals, graphite floor mats with unique blue piping, Infiniti Hard Drive Navigation System, Around View® Monitor (AVM) and much more. There's plenty of power from the 3.5-liter V6, 303 horsepower and 262 lb.-ft. of torque to be exact, and intelligent all-wheel-drive handles the light offroading chores. There's a ski mode for going up to the cabin in Lake Tahoe, but you won't want to do much more dirty driving than that. You don't want to damage those 21-inch rims! The FX comes with a seven-speed standard 7-speed automatic transmission featuring Adaptive Shift Control (ASC). It reads the way you drive and sets itself up to accommodate you. 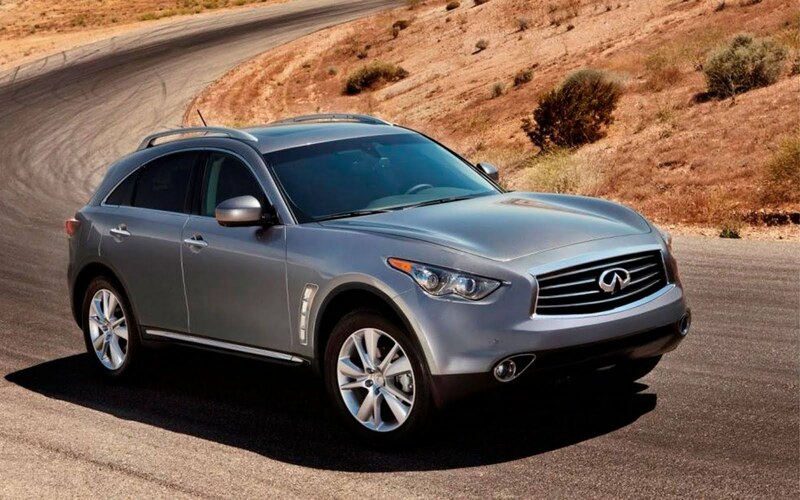 The FX35 earns 16 City, 21 Highway (18 mpg average) from the EPA. I averaged 19.2 mpg. The EPA Green Vehicle Guide numbers are 5 for Air Pollution but just 3 for Greenhouse Gas. It's a world of leather inside, where the rounded look continues. You'll find leather hides on the seats, (with 10-way heating), steering wheel and shift knob. The interior panels have an "inflated" or convex feel to them, implying fullness and richness. Features to coddle you include the Infiniti Intelligent Key with Push Button Ignition and Sequential Welcome Lighting Illuminated Entry system. It starts with turning on the outside mirror courtesy lights as you approach the car and continues to light key areas as you and your passengers settle into the interior. I was very impressed with the advanced Bose® Premium Audio system, acoustically engineered to optimize sound inside the FX. It features 11 speakers, an AM/FM/CD player and a USB connection port for iPod® Interface and other devices. Also standard are XM® Satellite Radio (you pay for the subscription separately), diversity antenna and steering wheel-mounted remote audio controls. I was annoyed at how non-intuitive the Bluetooth phone connection was, but I’m getting used to it being tucked away in hard-to-find places. Someday it’ll be easier. Also, this vehicle proved to be one of the ones that can’t retain your track shuffle when you turn off the ignition. I had to re-select it each time. Another great high-tech feature is the Distance Control Assist (DCA) system. It automatically helps you maintain a set distance to the vehicle ahead when traffic conditions require frequent braking. DCA gives the driver feedback through the accelerator pedal. If the distance falls below a certain threshold when approaching a car from behind, the FX automatically brakes to help maintain a safe distance. If you’re on the throttle and the system thinks you need the brakes right now, DCA pushes back gently on your foot. If you don’t act, you’ll feel a more insistent double impulse from the pedal and hear a signal. As soon as you release the throttle, DCA automatically engages the brakes. I like the way you can see the curving front fenders from the driver's seat. So often these days you can't see the outside of the car at all from the driver’s seat. My all-wheel-drive Limited tester came to $52,445. The FX35 starts at $44,595 for the rear-wheel-drive model and the all-wheel-drive model that’s not a Limited is $1,450 over that. The FX50, with a 390-horsepower 5.0-liter V8 engine, will run you $60,695.